A variety of live foods are available on the market today, and are great for the successful breeding of many finches who require insects in the diet in order to rear their young. Among the most popular live foods are: mealworms , ants' "eggs" (actually pupae; buy them frozen, not dried--take out a small portion daily, thaw it, and provide to your birds),14 fruit flies (which now come in flightless mutations--the "wingless" or apterous Drosophila melanogaster and flightless Drosophila hydei), crickets , and wax moth larvae . These live foods can often be obtained online, through a pet store (check the reptile section), or from a bait store. If you purchase any live food, however, make sure that it isn't artificially dyed. Purchased foods often come with instructions on how to maintain the unused portion of live food until it is needed. Aim to obtain live food which is small enough for finches to consume easily: mealworms of the "mini" or "small" size (about 0.5" long), young crickets which are smaller than a pea, etc. Additional live foods which may be accepted by finches include: whiteworms (Enchytraeus albidus), termites, small spiders, grasshoppers, small locusts, aphids, and stick insects. Some breeders also offer foods traditionally used for feeding fish such as tubifex worms and water fleas (aka daphnia).15 Small Phoenix worms (black soldier fly larvae) may be a suitable alternative to termites since they have a similar appearance. Earthworms (less risk of transmitting disease if these are cultured instead of collected from the wild) and silkworms may also be worth considering as live food options for finches. Note the similarities between the termite (left) and Phoenix worms (right). Try to steer clear of feeding your birds maggots, however; because maggots feed on rotten, putrid flesh, they may be carrying fatal toxins in their gut which cause botulism.30,14 Additionally, the warm, damp conditions of maggot rearing can lead to problems with Candidia.41 To reduce the risk of botulism, it may be possible to raise your own maggots at home on canned dog food instead of rotting meat; additionally, maggots can be stored in bran for 4 days (until all traces of undigested food--which appears as a dark line or spot in the gut of the maggot--have disappeared) prior to being fed to birds.14,23,34 Still, many would not risk feeding maggots now that safer alternatives are readily available. "Gut-loading" the live food with a calcium-rich diet just prior to offering them to the birds. Ensuring that a source of calcium supplement such as cuttle bone, chopped boiled eggshell, and/or crushed oyster shell is always freely available to your birds. Feeding your finches a base diet that has an appropriate balance of calcium such as pellets. There are several good reasons to consider raising your own live food: you can save money if you are feeding a larger group of insectivorous finches, you can ensure a steady supply of live food (for example, sometimes it is too cold to have live food shipped), and most importantly: you can better control the quality and nutritional value of your live food. Mealworm culture. Photo by Ben Grantham. Some breeders will wait until their breeding insectivorous finches have started laying eggs, then will allow the pair to leave their enclosure of their own free will (termed "liberty breeding")14 and venture to the outside to hunt bugs. This may not be legal in some areas (illegal in the United States and the UK, for example)40, and comes with the very large risk that one or both birds could be injured, lost, or killed. It is not recommended. Alternatively, insects can be caught or collected from the "wild" and brought to the birds. * With the help of a fine-meshed net (butterfly net) and a collection vessel (e.g. critter keeper with a fine mesh top), you can hunt through tall grasses and under rocks and fallen logs, etc. Be careful as hunting for insects may increase your risk for encounters with biting, stinging, or venomous creatures. Yet another, easier, option is to take steps to attract wild insects to your birds' (outdoor) enclosure. 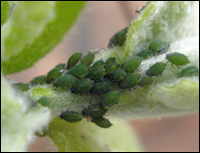 Aphids on a plant. Photo by Mick Talbot. Try adding plants which attract bugs to the birds' enclosure. Hops14, rose bushes, bean plants, nasturtiums,30 and the panicles of Poa annua grasses,23 for example, may attract aphids (aka "greenfly"). Install a "night light" in the aviary; moths and other bugs will be attracted to the light at night, and your birds will be able to eat them the next day. Fill a ventilated container (e.g. margarine tub or mason jar covered with ~¼" diameter aviary mesh) with over-ripe fruit such as banana or pineapple and place it in the aviary to attract fruit flies while keeping the birds out of the (rotting) fruit. Replace/replenish the fruit as needed. *Method for Collecting Ant "Eggs"
Lay a sheet of canvas in a sunny area approximately 20 feet from a fresh-looking ant hill, then sprinkle a few sticks and dead leaves along the edges of the canvas. Next, fold the edges over the sticks & leaves to form a continuous "flap" approximately four inches wide all around.14 Early in the morning (about 2 hours after the sun has begun to shine--since the ants tend to move their pupae deeper underground by mid-day),23 use a long-handled shovel to scoop into the top center of the ant hill and dump the top of the nest onto the middle of the canvas sheet. The ants will collect the pupae and move them to the shade of the perimeter flap, where they can then be brushed gently into a collection container14 and frozen. Alternatively, you can use a long-handled spoon to scoop the top center of a fresh-looking ant hill directly into a jar, replace the lid, then transport home to freeze. This method may be a little faster, but you will have sand and ants in the collection jar in addition the pupae. Not all adult ants are palatable to finches. First, be aware that not all species enjoy live food, and that some only seem to show interest when they are breeding or have chicks in the nest (e.g. strawberry finches). Many species who may at times eat insects in the wild or in captivity can be easily and successfully bred without the use of any live food (e.g. lady gouldian finches, owl finches, zebra finches, society finches, shaft-tail finches, star finches, etc. ), however some breeders do report that clutch sizes may be increased when live food is made available. 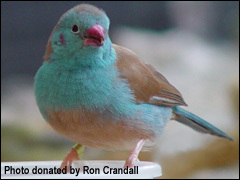 No finch species in a nonbreeding aviary requires live food for survival as long as its diet is otherwise balanced and nutritionally adequate. However, there are a number of species which reportedly will not breed successfully without a plentiful source of live food. This list is not exhaustive. The species listed above tend to do best when offered a variety of live food which is still animated, although in some cases with persistence and patience, you might be able to wean the breeding birds onto an insectivore diet and/or offer deceased (frozen/thawed, freeze dried, etc.) insects instead. Most birds prefer live food that moves. In time birds can become accustomed to less and less active, and eventually nonvital insects as food, but when first offering live foods, make sure they are alive & moving. Some birds may be more open to trying "freeze dried" varieties if they are soaked first or chopped and mixed into an already-relished treat such as an egg mix. Repetition. It may take some time and repeated attempts before the birds will sample the new food item(s). Wild finches seek insects in the same places as they do seeds, and some species can also catch flying insects such as termites mid-air. Ground-feeding species may wait at daytime-active termite nest entrances or even break open the covered surface runways of the termite mound and eat the bugs they find. Most species nibble and crush the insects and swallow them whole. Some species, such as the Blue-capped Cordon Bleu, may pick up grasshoppers with the bill and beat them against the ground, breaking them apart. This may also happen with larger caterpillars. Some birds will eat the heads off of mealworms and discard the body. Others will squeeze the soft contents out of a mealworm by repeatedly passing it through the bill, then discard the exoskeleton. When parent Estrildid finches feed their young, they do so via regurgitation; live food does not appear to ever be fed directly to the young without the parent bird having swallowed it first. For breeding finches, the live food should never be allowed to run out; there should always be some left over when the next feeding is due.41 The exact quantity of live food to offer depends on many factors including species being fed, number of adult birds being fed, number of chicks in the nest, and so forth. Demand may vary somewhat through the breeding season; trial and error will be the best way to determine how much live food your specific group of finches requires to last them the full day without running out. At least two (often more) feedings are required daily while chicks are in the nest.30 Most breeders offer live food at least 3 times throughout the day (at sunrise, mid-day, late-afternoon/early evening) in hopes that their birds will not sense "famine" and toss chicks from the nest. Routine is important and the birds should be fed at the same times every day.41 The best results are obtained if a continuous source of live food can be provided. Using Fruit Flies Indoors: Place about 1" of dry culture medium in the bottom of a mason jar and mix in slightly more water than medium; add Excelsior (wooden craft straw, or similar) to the jar that the larvae will use to pupate. Add ~15 adult flies to the jar and cover the top with a disposable coffee filter secured in place by the jar's metal screw band (lid ring). The flies will breed; once their pupae have started to hatch and young flies have begun emerging, poke a very small hole (just large enough for a fruit fly to get through) in the coffee filter and place the jar on its side in the enclosure. The jar is still productive as long as there are some adults and moist culture medium present in the jar. New cultures will likely need to be started weekly. Expended jars can be reused once emptied & washed. Using Crickets: Use a PVC tube/hose to connect a plastic cricket pen containing the appropriately-sized crickets to a hand-made 'cricket cup' which is suspended on the wall of the enclosure. The crickets will travel up the tube into the cricket cup where they may be eaten. Photos demonstrating this concept. Additionally, providing the live food partially hidden in a little bran or otherwise encouraging the birds to "hunt" for their food may help keep the birds occupied. This may slow down the disappearance of live food from the feeding tray a little, and provides an enrichment activity for the birds. To slow some live food (crickets, mealworms) down, try placing them in the refrigerator for about 5 minutes before offering them to the birds.8,30 Refrigeration will kill wax-worms and fruit flies; it can also kill crickets if left in too long. Wingless Fruit Flies can be dusted with calcium powder (a commercial product or dried & pulverized boiled eggshell would work) to inhibit their movement (and make them a healthier foodstuff) and then be offered in a container with slick sides (e.g. smooth ceramic bowl). Mealworms can also be offered in a ceramic bowl or a reptile "worm dish." These style dishes do not allow the worms to crawl out, though birds may pick up then drop the worms outside of the bowl. If the enclosure is large enough to accommodate it, offer the live food in a tall, slippery container which is wide enough for a bird to fly down into such as an empty & clean cardboard ice cream tub. If the enclosure is large enough to accommodate it, place the container holding the live food within a wide, shallow 'moat' of water. If your birds will accept non-moving foods, frozen-thawed insects which are no longer live pose no risk of escape. If possible, consider keeping button quail in the enclosure to eat any escaped or discarded insects off of the floor. 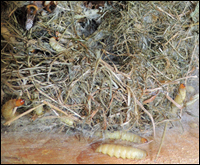 Wax-moth larvae infesting bees in nest. The majority of live foods offered to finches are considered house pests and can infest or damage items in your home if they escape or are able to breed successfully in your home. (Exception: Stick insects should not cause major problems if they escape into the home since they feed on plants.34) Some of the insects may be unpleasant to keep (e.g. crickets chirp loudly and can become malodorous). Additionally, some are nuisance species even outside of the home; the wax-moth for example infests bee colonies and can contribute to their collapse. One method of attempting to wean insectivorous birds off of live food when breeding is to make a regular habit of offering small, white "worms" (such as mealworms which have very recently shed their skin) to the birds. Once they accept this form of live food, gradually start introducing worm-shaped & sized pieces of boiled egg white along with the white live food worms. Boiled egg white can be grated on the fine setting of a cheese grater or pressed through a potato ricer , noodle press, or similar kitchen gadget in order to create pieces with "worm-like appearance." Over time, more egg white "worms" and fewer live worms can be provided. If the birds tolerate this process, you may be able to eventually convince them to take the grated egg solely without the live food. Please know that this is not guaranteed to work, especially for newly-acquired birds (their offspring, when of breeding age, may be more tolerant of the attempt). Depriving insectivorous breeding birds of live food does come with the risk of them failing to breed or abandoning or tossing their chicks, so be prepared for these possibilities before attempting to wean them from live food.